Life at Renfrow’s was very different during World War II than it is today, so we saved a few relics to remind us of those times. Henry Renfrow Massey, the store manager in those years, was drafted into the military alongside many seasonal young workers at the Renfrow Cotton gin and from the farms in Matthews. Women and the older men had to step into those roles and help out at the store and around town. Cotton was “king” and the government bought all the cotton that the store could bale up for the war effort. The pinch of cotton in this photo is from the last bale ginned in Matthews, still residing at the hardware store (more details about that to come at a later date). Sugar, fuel, and tires were rationed. Renfrow’s store was involved in issuing ration cards. Copper was needed for the war so electrical fuse elements were made of zinc for awhile. They were of such poor quality that we still have quite a supply of “Victory Fuses” left over from those days. 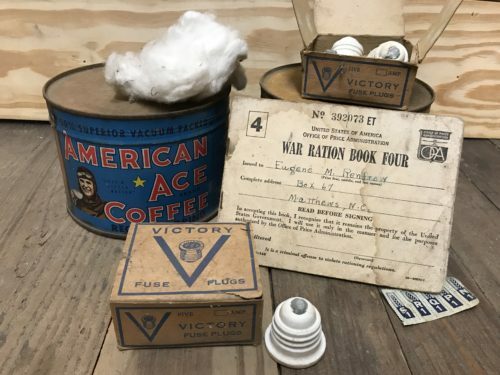 Coffee was prioritized for the folks in uniform and “American Ace” was the brand Renfrow’s carried. Notice the soldier on the canister. Renfow’s was still a General Store and sold lots of groceries and dry goods. Coffee was rationed for awhile during the war but was the first to come off the ration list, to everyone’s relief. This post is part of our weekly #RenFrowBackThursday history series, where we reflect on various pieces of history of Renfrow’s, the town of Matthews, and their beloved citizens and customers.